FORMULA ONE’s jewel in the crown is the Monaco Grand Prix and it has staged an event in every single year of the Formula One World Championship. I won’t be covering the whole history, just within the last 20 years but I have to start with one exception. The closing laps of the 1982 event have gone down in living memory. Longtime race leader Alain Prost crashed his Renault on a slippery circuit with only a few laps remaining. This handed the lead to Riccardo Patrese, who promptly spun his Brabham at Loews and allowed Didier Pironi into the lead. The Frenchman only led for a few hundred metres until his Ferrari spluttered to a halt, out of petrol. Andrea de Cesaris briefly inherited the no.1 position before he did what he did best, crashed! Derek Daly became a challenger before coasting to a halt after terminal damage was caused to his Williams. James Hunt famously said in the BBC commentary box; “Well we’ve got this ridiculous situation where we are waiting for a winner to come past and we don’t seem to be getting one.” Finally, Patrese regained his composure to win his first ever Grand Prix. In 1992, Nigel Mansell was aiming to become the first driver to win the first six races of the season since Alberto Ascari in the 1950s. It looked on course in Monaco until a late pitstop to replace a slow puncture. The Brit, another never to win in the Principality came out behind the master of Monaco, Ayrton Senna. What followed was one of the most doggest pursuits in the archives as Mansell tried everything to get past Senna’s slower McLaren Honda. The Brazilian’s remarkable defensive driving earnt him a fifth Monaco victory and in 1993, he made it six. Little did we know that he wouldn’t be back in 1994 to make it seven. The 1994 event was always going to live in the shadow, especially as it was just two weeks after the painful and tragic weekend at Imola, which accounted for Senna and Roland Ratzenberger. In Thursday free practice, Karl Wendlinger lost control of his Sauber Mercedes and crashed on the approach to the chicane. Wendlinger suffered serious head injuries and fell into a deep coma. Although he made a full recovery, his F1 career was effectively over. A first lap collision between Damon Hill and Mika Hakkinen helped Michael Schumacher cruise to his first Monaco GP success, 40 seconds clear of Martin Brundle in a McLaren Peugeot. Hill was another Brit to be out of luck in Monte Carlo and was denied a clear victory in a crazy 1996 race which saw just four of the 21 starters make the finish. Schumacher had moved to Ferrari and started on pole position, before making an uncharacteristic mistake and crashing out at the Portier on the first lap. It was the same place where Senna had famously gone off in 1988 and became so distressed, he went home for hours after the race. Hill built up a 30 second lead before a rare Williams Renault V10 engine failure exiting the tunnel on lap 40 forced him into a gut-wrenching retirement. Jean Alesi was the next leader but a wheel bearing problem forced him onto the growing list of retirements. After all that, a masterful decision on tyre choice saw Olivier Panis come through from 14th on the grid to record his first and only victory and the last for the Ligier Formula One team. For the record, only David Coulthard, Johnny Herbert and Heinz-Harald Frentzen also made the finish. Schumacher showed his skill around Monaco in 1997 on another wet day. He charged into the lead from second on the grid and built up a colossal 22 second lead within five laps, winning in the end by nearly a minute. The Williams team made a bizarre decision to start Frentzen and Jacques Villeneuve on slick tyres and both would crash out. Rubens Barrichello held his nerve to finish an extraordinary second for the brand new Stewart team in just their fifth race, bringing Sir Jackie Stewart, a three-time Monaco winner himself to tears. One Brit who had success in Monaco was David Coulthard. The Scot won this famous race twice. In 2000, he inherited victory after Schumacher’s Ferrari suffered a suspension failure, having led by 50 seconds at one point. In 2002 DC battled an engine problem and stiff challenges from the Williams and Ferrari teams to record a popular victory for McLaren. It was the only time the Ferrari F2002 was beaten in the 2002 dominant campaign. Juan Pablo Montoya recorded a super win for Williams in 2003, their first success in Monaco in 20 years and a year later, it was Jarno Trulli’s turn to taste victory. Trulli’s only Grand Prix victory came on a weekend where the Renault team had the fastest car throughout. Schumacher lost his chance of winning the first six races in a season, following a controversial clash with a lapped Montoya in the tunnel behind the Safety Car. No man has dominated Monaco since Schumacher’s first retirement, with Fernando Alonso coming the closest, recording back-to-back successes in 2006 & 2007 for Renault and McLaren respectively. The 2006 event’s main headline was Schumacher’s parking attempt at Rascasse in qualifying which was a deliberate attempt to stop Alonso, Mark Webber, Kimi Raikkonen and Giancarlo Fisichella beating his fastest time. The stewards sent him to the back of the grid and he was vilified in the entire paddock. Some say it was his antics in Monaco that played a part in him announcing his retirement later in the season. The honours in the last four seasons have been split between Lewis Hamilton, Jenson Button, Mark Webber and Sebastian Vettel. To win Monaco, you need speed, skill, a bit of luck and total commitment as one mistake and it is an expensive accident against the magnetic attraction of the barriers. Considering the unpredictable start to 2012 so far, a sixth different winner is highly possible, especially on this circuit where form can fluctuate. 1. The epic battle between Ayrton Senna and Nigel Mansell for the victory in 1992. 2. Olivier Panis achieving victory against the odds in the crazy 1996 event. 3. Michael Schumacher’s masterclass in the wet in 1997. 4. Red Bull’s amazing celebrations after Mark Webber led Sebastian Vettel home to a 1-2 in 2010. 5. That unforgettable finish in 1982; the race that no-one seemed to want to win! 6. Alexander Wurz taking on Michael Schumacher in a fantastic battle in 1998, the highlight of Wurz’s F1 career. 7. Jenson Button parking in the wrong place and having to rundown the start-finish straight to the crowd’s acclaim, following his dominant performance for Brawn GP in 2009. 8. James Hunt calling Rene Arnoux “b######t” in 1989 live on the BBC. Well you might as well be honest about someone at the end of the day! 9. David Coulthard achieving Red Bull’s first podium in 2006, then going onto the podium dressed in a Superman cape! 10. The first signs Ayrton Senna would become a superstar, in the shortened 1984 race for the underfunded Toleman team. IN MY final blog this week remembering the ghastly weekend at Imola in 1994 – it is time to look at the aftermath of the events and how the sport has moved on with radical and rapid improvements in medical facilities, safety and learning lessons from very dark and distressing times. In the days after Imola, there was a lot of soul searching to be done by everyone who was involved in the weekend’s proceedings. Gerhard Berger, who was driving for Ferrari had to consider his future in the sport, especially after witnessing the death of his closest friend Ayrton Senna and countryman, Roland Ratzenberger. Others had sleepless nights but the show carried on and all the drivers who raced at Imola in 94 didn’t retire in its aftermath. The FIA and especially its president, Max Mosley were inspirational in a time of real crisis. They made immediate changes to safety regulations in the sport, beginning from the Spanish Grand Prix, just two races after Imola and contiuning with this until well into 1995. Changes included the introduction of the ‘plank,’ to remove illegal skidblock wear which was the downfall to Michael Schumacher’s disqualification after winning at Spa that August. Driver cockpit sides were strengthened and made bigger and the FIA crash test came into force as a mandatory procedure, both in frontal and side impacts. A new pitlane speed limit was brought into force to reduce the chances of significant injury after the Michele Alboreto incident in the pits at Imola. These changes were too late to save some from other nasty accidents. Austrian Karl Wendlinger fell into a deep coma after crashing at the Nouvelle Chicane during practice for the next race in Monaco. Wendlinger’s injuries were caused thanks to driver impact from the barriers. Pedro Lamy had a monumental shunt during private testing at Silverstone in which he was ejected from his Lotus Mugen Honda. Lamy survived but suffered serious leg injuries and multiple fractures. In Barcelona, the destroyed Simtek team had to deal with another cracked monocque when Andrea Montermini ran wide into the final corner and crashed heavily during practice, fracturing his heel and breaking his foot. However driver injury has become far less in recent years. There have been close escapes, with Felipe Massa especially in 2009. Although there were two marshal fatalities due to flying debris at the beginning of the millennium, the most serious driver injury since 1994 was Olivier Panis breaking both of his legs after a suspension failure pitched him into the barriers during the 1997 Canadian Grand Prix. The FIA continue to set the standards in safety today. The deaths of Marco Simoncelli in MotoGP and Dan Wheldon in IndyCars last October highlight that motorsport is dangerous and always will be. However it is much safer than it ever has been. In the wake of the Imola tragedies, the GPDA was reformed, having been disbanded in 1982. Three time world champion Niki Lauda initiated its return with Berger, Michael Schumacher and Christian Fittipaldi as directors. Membership isn’t compulsory but many of today’s drivers are part of the association. Temporary changes were made to many circuits including ridiculous but necessary tyre chicanes in Barcelona and the slowing down of cars for one year through the daunting Eau Rouge corner at Spa. A year later Formula One returned to Imola with permanent chicanes installed at Tamburello and Villeneuve corners to slow the cars down. Again, these measures were needed to slow the average speeds down but Imola lost its glory as a drivers circuit, often produced processional events and was axed from the F1 calendar at the end of 2006. Schumacher remained chairman of the GPDA for 11 years until his first retirement in 2006. Today’s chairman is experienced Spaniard Pedro de la Rosa with Massa and world champion Sebastian Vettel as directors. The cause of Ayrton Senna’s fatal accident is unlikely to ever be found out. There have been many points of speculation including a terrible Channel 4 documentary in 2001 as part of the ‘Going Critical’ series where it was wrongly promoted the whole truth would be revealed. There was a high-profile trial into the case in Italy and Sir Frank Williams, Patrick Head and Adrian Newey were all acquitted of manslaughter in 1997. It would be wrong for me to speculate on what caused Senna’s accident although driver error was very very unlikely. For a car to crash at Tamburello, something would have to break or explode on the car, as Berger experienced at the same spot in the 1989 race. Roland Ratzenberger’s accident was caused by his front wing breaking as a result of it being weakened by impact with either an off-track moment or a high kerb. Ratzenberger’s car went straight on into the concrete wall with no steering or braking capability due to the loss of the front wing. The legacy of both Ayrton Senna and Roland Ratzenberger’s accidents and the entire weekend at Imola is that Formula One has taken onboard what happened and has done all it has to make sure that these kinds of tragedies are prevented in future. Death in F1 has happened before and it will at some stage, probably happen again. However so many precautions have now been taken and that is thanks to the hard work of the drivers and the FIA. Everyone wants to race in a safe environment and to a large extent, this has been achieved since that terrible weekend in April/May 1994. Neither Senna nor Ratzenberger will be forgotten by the Formula One fraternity. The experience of these hellish events has made Formula One a safer environment today. THE penultimate blog from remembering Imola focuses on the career and the life of Ayrton Senna, eighteen years after he tragically perished at the wheel of the Williams FW16 in the 1994 San Marino Grand Prix. Forget Juan Manuel Fangio and Michael Schumacher. In my opinion, Senna was the greatest ever human being to drive in Formula One. Senna was very successful in the junior formulae in Brazil and in England. He begun karting at the tender age of four. For him, racing was in his blood and so to was his will and desire to win. To him, second place wasn’t acceptable; he felt it was first of the losers. He underlined that ruthless streak early on in his career, in the tense and exciting duel with Britain’s Martin Brundle for the 1983 British Formula 3 Championship. Senna dominated the first half of the season, Brundle the second half and it left Ayrton to pull off some crazy overtaking attempts that often ended in accidents. Eventually he overcame Brundle in the season finale at Thruxton and Formula One beckoned. Despite testing for McLaren and Williams in the winter of 1983, Senna opted to sign for the Toleman team, later to become Benetton. Immediately Senna made an impression, despite his inferior equipment. He came so close to winning his maiden race in 1984. In Monaco Senna made full advantage of the awful weather conditions, to charge through from 12th on the grid. He pulled off some stupendous overtaking moves, with the confidence that suggested he would be a champion in future waiting. Only a red flag that brought the race to an early conclusion denied him. Senna insisted that he would have won if the race had it run just one more lap. The determination to succeed was firmly there. Podiums at Brands Hatch and Estoril followed but Senna knew that Toleman was not a long-term stay. He went to Lotus for the next three seasons, convinced that this might be the team that could deliver him the world championship. In only his second race for the famous British marquee, Senna won in Portugal – in very similar conditions to those of Monaco 1984. Second placed Michele Alboreto was the only driver not to be lapped, in a clinical and masterful performance in the wet. Not only did Senna become a great wet weather runner, he developed a close association with the Japanese manufacturer Honda in his time at Lotus and also the amazing skill he had to produce a flying lap. Eight pole positions in 1985 and this skill remained with Senna all the way till his untimely death. Although Schumacher has beaten this statistic, it took him twelve years to do it after Ayrton’s death. 65 pole positions in 161 races, over 33 per cent is one of the most impressive ratios I’ve ever seen. In his three years with Lotus, Senna achieved third place in the 1987 championship and six wins in total, including a maiden triumph on the streets of Monte Carlo. However the British team was on a steady rate of decline and Ayrton elected to jump ship, taking Honda with him to McLaren. Frustrated by seeing the more superior Williams of Nelson Piquet and Nigel Mansell often get the better of him despite his undoubted talent, Senna was convinced the switch to McLaren would finally give him the success it craved. There he was partnered with the Frenchman Alain Prost, the golden boy of McLaren at the time. Fireworks would explode between the pair, though not initially. The 1988 McLaren Honda was the most dominant car in Grand Prix history, winning 15 of the season’s 16 races. If Jean-Louis Schelesser hadn’t taken Senna out in the closing stages at Monza, it could well have been a clean sweep. Senna won eight races to Prost’s seven – though the ‘Professor’s’ consistency meant he went on to score more championship points. However on a countback system, which the sport used at the time, Senna knew that victory in the 1988 Japanese Grand Prix would be enough for his first championship. The start was a disaster as Senna squandered pole position and dropped to 14th by turn one, giving Prost a colossal advantage. Very quickly Senna showed the superiority of his McLaren and charged through the pack. By lap 16, he was fourth and eleven laps later, was challenging for the lead. When Prost was trapped in backmarkers, Senna seized his opportunity and squeezed past his team-mate on the start-finish straight. It was a clinical piece of overtaking and a drive that thoroughly deserved to win the championship. Prost was very gracious in defeat, admitting that Senna had been the better driver during 1988. Apart from a moment in Portugal, when Ayrton had nearly put Alain into the pitwall, their battle had been a joy to watch in 1988. Sadly the next two years bought politics and accusations to the heartfelt of the sport. Race two of 1989 was the San Marino Grand Prix at Imola. Prost and Senna entered a gentlemanly agreement, that the man who approached the braking point for the Tosa hairpin first, would go onto win the race. Senna took pole position and led on the first lap. However when his good friend Gerhard Berger crashed at Tamburello and his Ferrari burst into flames, the race required a restart. Second time round, Prost made the better start and led approaching Tosa. Senna, presuming that the agreement was only meant on one attempt, stole the lead into the hairpin and drove into the distance. It was perhaps a gentle misunderstanding but Prost, who finished over a minute adrift refused to talk to Senna again. 1989 was not a lucky year for the Brazilian, losing certain victories in USA, Canada and Italy due to mechanical problems, whilst he was taken out in Portugal by the already disqualified Mansell. Once again Suzuka would be the deciding factor in the championship battle, this time with Prost the favourite. Senna had to win to stand any chance of taking the fight to Adelaide. He lost the lead with a poor start and harassed Prost all afternoon, with little chance of getting ahead. On lap 47, he closed up and made his move into the final chicane. Prost, knowing that Senna had to win turned into the corner and the accident was inevitable. The two McLaren cars interlocked wheels and slid to a halt. Prost unbuckled his belts and walked away but Senna kept his engine running and restarted. However he needed outside assistance from the marshals to get going again. Despite needing to pit for a new nosecone, catching and overtaking the Benetton of Alessandro Nannini, Senna won and was promptly disqualified for the outside assistance offence. Prost was champion. Ayrton was furious, threatening to walkaway from the sport he loved, believing that a conspiracy had been set-up against him by Prost and the unpopular FISA president, Jean-Marie Balestre. More allegations and accusations followed and Senna’s super license was revoked. The following March he was back, having apologised and won the season opener in Phoenix. Once more the fight for supremacy was between Senna’s McLaren Honda and Prost, who had swapped seats with Berger and moved to McLaren’s closest rivals Ferrari. For the third successive year, Japan was the deciding point for the championship saga. This time it was Prost who needed to win to keep his title dream alive. Senna took his customary pole position but bitterly complained all weekend that pole position was on the dirtier side of the grid. He campaigned for it to be changed and Prost actually agreed. The officials granted Senna’s request, but Balestre refused to back down. Consequently Senna vowed that if Prost turned into turn one first, he would regret it. Twenty-four hours later and Senna accelerated away but Prost got the better start and took the lead. Senna looked for a gap on the inside of the first corner that disappeared quickly. Contact was inevitable and the McLaren and Ferrari disappeared into a cloud of dust. The outcome of the 1990 FIA Formula One World Championship had been decided in a matter of seconds in such sad and distasteful circumstances. It was a second title for Senna but bittersweet. Only at the same event a year later, with Balestre gone and replaced by Max Mosley did Senna admit that he deliberately ran Prost off the road in 1990. His will and desire to win couldn’t be faulted but in attempting to knock another car out on purpose was a hideous crime, which on a normal UK road would land you with at least a driving ban and possibly a jail sentence. In 1991, Senna won his third and last drivers title for the umpteenth time at Suzuka, the deciding point of most title battles. Prost fell away and was fired by Ferrari before the season’s end, so it left for a renewed rivalry to remerge between Senna and Nigel Mansell. Senna won the first four races in 1991 but as the Williams Renault became the stronger package during the campaign, Senna grew frustrated realising that McLaren were being out developed by a rival for the first time in his stint with the Woking team. Eventually reliability and a terrible pitstop in Portugal shot down Mansell’s 1991 title dream but not for the worth of trying. 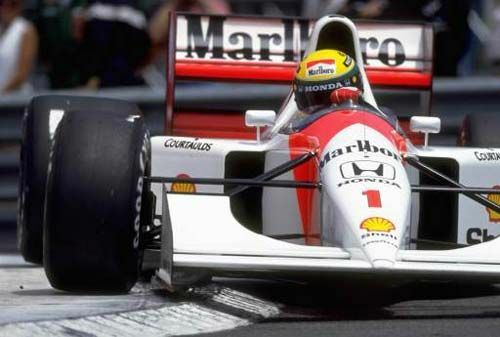 He went wheel-to-wheel with Senna, sparks flying at some 200mph down the backstraight of Spain’s Circuit de Catalunya in Barcelona, one of the sport’s most iconic images. As the Williams team mastered the active suspension system, McLaren drifted further behind and Senna had to work especially hard for any of his later victories in his career. 1992 was a major disappointment, as Ayrton finished 4th in the final standings with just three wins, compared to the nine of the dominant Mansell. One of his greatest victories came in Monaco 1992 when he managed to hold off a hard-charging Mansell, who clambered all over the back of his McLaren in the last five laps. Honda pulled out of F1 at the end of the season and Senna questioned whether he should remain in the sport, especially when Prost ‘vetoed’ him not to drive alongside him at Williams in 1993. Senna decided to stay with McLaren on a race-by-race basis in 1993 and was excellent throughout the season. There were memorable victories in Brazil for the second time at home, Japan, Australia and for a record sixth time in Monaco. However he saved the best for a damp Easter weekend in 1993. The venue was Donington Park for the European Grand Prix. Senna qualified 4th and was squeezed out by the uncompromising Michael Schumacher on the rundown to Redgate. Undeterred he sprinted past the young German on the exit and then swept past the fast-starting Karl Wendlinger in his Sauber around the outside of the Craner Curves. Next target were the dominant Williams and just three corners later, he went inside Damon Hill to move into second. He tore into Prost’s early advantage and outbraked his chief rival into the Melbourne Loop. He had gone from fifth to first by the end of the first lap, definitely the greatest lap in Grand Prix history. Senna won the race from Hill by nearly a full lap. For 1994 Senna got his dream move to the Williams Renault squad. With Prost having retired and Mansell competing in IndyCars, this was Senna’s chance to add to his forty-one victories. Sadly the partnership that promised so much never came to fruition. Senna didn’t like the handling of the FW16 and had a miserable first two races. He spun off and stalled his engine in Brazil, chasing down Schumacher’s Benetton. Then he was tipped off the road by Mika Hakkinen into the first corner of the Pacific Grand Prix. Arriving at Imola, Senna had no points, Schumacher twenty. Autosport magazine claimed he was a man under pressure. He didn’t show it though, focused on his goal to bring Williams back to the top after an unconvincing start. He blitzed the entire field in San Marino, setting the quickest time in every single session. However accidents to his countryman Rubens Barrichello and the death of Austrian driver Roland Ratzenberger in qualifying deeply affected Senna. Ayrton Senna is a legend who leaves an endearing legacy to many and is a sporting legend forever. REMEMBERING Imola continues with a deeper look into the catalogue of horrific events at the 1994 San Marino Grand Prix. A weekend that changed Formula One racing forever. 18 years on, the safety of today’s modern Grand Prix cars has improved greatly. Sadly though it happened at the loss of taking away the life of the greatest Grand Prix driver of his generation, Ayrton Senna. The horror of the weekend began on Friday 29th April 1994, when in the first official qualifying session, the young Brazilian Rubens Barrichello lost control of his Jordan Hart car approaching the quick Variante Bassa chicane. His car launched off a kerb and smashed into the tyre wall at colossal speed, narrowly avoiding going over some catch fencing. Only the quick reactions of Professor Sid Watkins prevented the talented Barrichello, second in the drivers championship at the time from swallowing his tongue. Remarkably he walked away with just a cut lip, minor bruising and a broken nose. His weekend was over but his life had remained intact. It reminded Grand Prix fans and drivers of the real dangers that the sport possesses. Just 24 hours later, the luck ran out. Austrian Roland Ratzenberger was attempting to qualify for what only would have been his second Grand Prix, having finished his first race in Aida just a fortnight earlier. Eighteen minutes into Saturday’s second qualifying session, Ratzenberger’s front wing broke off exiting the flat-out Tamburello bend. His wing had been weakened by leaving the track on his previous flying lap at the Aqua Minerali chicane. With no steering or braking capability, the Simtek Ford car ploughed straight into the concrete wall at Villeneuve bend on the approach to the Tosa hairpin. The impact was thought to be close to 200mph. As soon as his car came to a halt, it became clear from a very early evident stage that Roland wasn’t going to be as lucky as Barrichello was. The session was stopped and the medics did what they could to save the rookie’s life. However it was to be a battle in vain, with Ratzenberger being pronounced dead on arrival at Bologna Maggiore Hospital. He became the first driver to be killed at a race meeting for twelve years, since Ricardo Paletti’s demise at the 1982 Canadian Grand Prix. The last driver to suffer a fatal crash in an F1 car was the Italian Elio de Angelis at the wheel of a Brabham, during a test session at Paul Ricard, France in 1986. On raceday, meetings were held between the drivers with the decision to announce the reformation of the GPDA (Grand Prix Drivers Association). In the wake of Ratzenberger’s accident, no-one could predict the chilling omens for raceday. 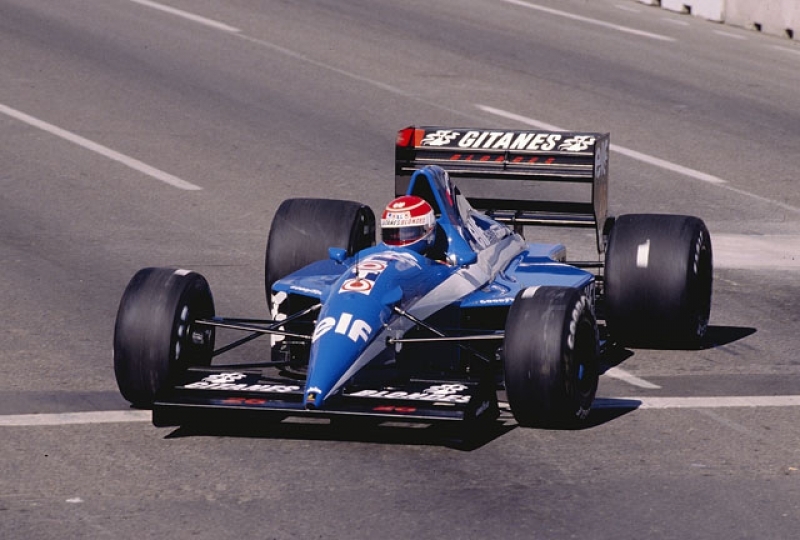 The show went on with David Brabham, Ratzenberger’s devastated team-mate electing to continue for the Simtek team. At the green light, Ayrton Senna stormed into the lead from his 65th pole position leading Michael Schumacher’s Benetton Ford and the Ferrari of Gerhard Berger. Further back, JJ Lehto had stalled his Benetton from row three on the grid. The two Ligiers of Olivier Panis and Eric Bernard narrowly missed the Finn’s stricken car but Lehto was to be collected by Pedro Lamy’s fast acclerating Lotus Mugen Honda. Lamy spun into the barrier and across the road with both cars completely destroyed by the impact. Lehto suffered a light arm injury and Lamy escaped unhurt but it was a wheel from the departed Lotus that caused the mayhem this time around. It vaulted into the spectactor fencing leaving nine people, including a policeman with minor injuries. Despite all the debris on the circuit, the decision was taken to deploy the Safety Car for only the third time in Grand Prix history. After five laps under the Safety Car, Senna charged away with Schumacher in hot pursuit. Two laps later, Senna’s car didn’t turn into the flatout Tamburello corner Tamburello corner, pitching straight on into a concrete wall at some 140mph, possibly even greater speed. The crumbled Williams returned to the edge of the circuit with Senna slumped in the cockpit, debris being thrown in all directions. The race was red-flagged. Once again it was clear that Senna was in a grave condition from the outset, with very little sign of movement from the cockpit of his car. As Professor Sid Watkins and the marshals got to work again, the severity of the crash especially from the pictures being beamed around the world on television made the scene even worse. Senna was airlifted to Maggiore Hospital from the track. As soon as the first medical bulletins filtered through from the track, any hope of a recovery was realistically lost. The race was eventually restarted 45 minutes later with Schumacher claiming his third successive victory in a very sombre atmosphere. During the race, the final event of a horror weekend occurred when a wheel departed from Michele Alboreto’s Minardi as he exited the pits from his final stop. The errant wheel bounced down the pitlane and struck one chief mechanic from Lotus and three from Ferrari. Luckily, none of the injuries were serious. 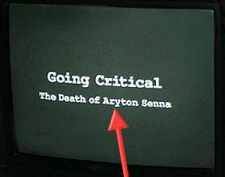 After the race, Senna was announced as clinically brain dead and his life machine was switched off. Brazil went into a state of national mourning, the world of sport stunned into silence. Fortunately the steps taken to improve safety in Formula One have been of massive leaps and boundaries. Many drivers since 1994, including Robert Kubica, Heikki Kovalainen, Takuma Sato and more recently in Hungary in 2009 with Felipe Massa have had serious, frightening accidents. All have been able to live the tail and go racing again. The 1994 San Marino Grand Prix will go down as the darkest weekend in motorsport history and eighteen years on, its pain will never heal. IN A NEW regular series, I will be profiling the careers of those drivers who won races and championships and those who either didn’t get the luck, or just failed at the top level of motorsport. All drivers featured will have competed between the years 1991-2011. The next entry was a breakthrough driver and gave Japan its first sight of the sport, which has continued to grow ever since. A pioneer for Japanese motorsport; Satoru Nakajima. BORN from a farming family, Satoru Nakajima had a passion for motorsport from an early age. His success in Formula One was largely modest but he set the path for a flux of Japanese drivers like Ukyo Katayama, Takuma Sato and his son Kazuki to have all appeared in the sport. Nakajima dominanted the Japanese Formula Two series but was a very late entrant into F1 at the age of 34. He debuted for the famous Lotus team in 1987, part of a new package which included Honda engines and Camel tobacco sponsorship. Nakajima drove alongside Ayrton Senna in his first season and was determined to be known for his own qualities rather than just a pay driver. Of course, he couldn’t compete with Senna but he showed flashes of natural speed. Scoring a point in only his second event at the 1987 San Marino Grand Prix was a good start and Satoru was part of a Honda grand slam at Silverstone, finishing fourth behind Nigel Mansell, Nelson Piquet and Senna. A further point in the inaugural Japanese event at Suzuka sent his home supporters mad and he finished a creditable 12th in the championship, having scored seven points in total. 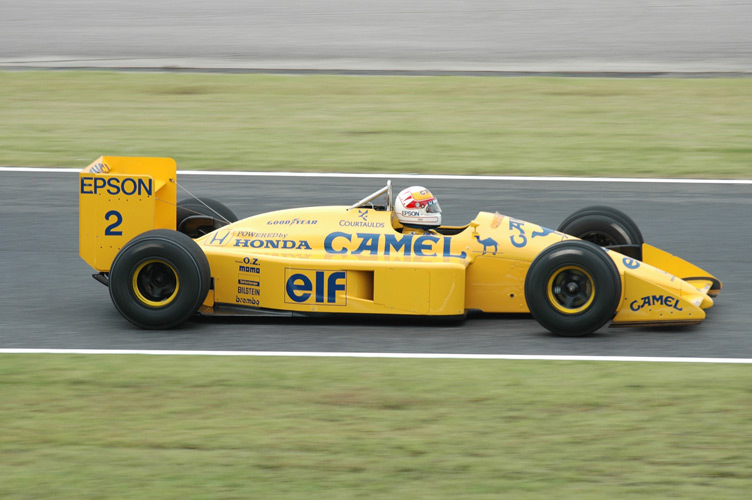 As Senna moved onto McLaren and the bitter rivalry with Alain Prost began, Nakajima stayed with Lotus for 1988 and was partnered by the defending champion Piquet. The season started prominsingly with a point in Brazil but Nakajima’s shock failure to qualify for Monaco was the beginning of the end for the Lotus Honda partnership, compounded when Piquet crashed in the race on the first lap. Satoru was never a fan of street circuits and he repeated his Monaco abscence on raceday by failing to make the cut on the temporary and dreadful Detroit circuit for the United States round. A spate of retirements and mistakes followed in the remainder of the season and it was a case of second season syndrome. Nakajima scored just one point all season and that was in the first race. As Honda focused on their dominance with McLaren, Lotus decline had begun. The team had to take the heavyweight Judd engine for 1989 and the failure of Nakajima and Piquet to qualify for the 1989 Belgian Grand Prix was the first time that the British make had no car on the grid in 30 years. He failed to qualify in Monaco again and Canada but it came good at the season finale in Australia. Watched by a massive Japanese audience, Satoru benefited from the filthy conditions in Adelaide to finish fourth from 23rd on the grid. In a race where staying on the circuit was a notable achievement, he set the fastest lap on lap 64 too. Two lacklustre years at Tyrrell followed for Nakajima. He paired up with Jean Alesi for 1990 and scored three sixth place finishes in the USA, Italy and once more on his Japanese homeland at Suzuka. There was a brief link-up with Honda again in 1991 as Stefano Modena joined Satoru. Fifth in Phoenix was his only highlight of 1991 although a mechanical problem robbed him of fourth in another wet race at Imola. He announced his retirement from Formula One at Hockenheim and bowed out with the minimum of fuss. His F1 career ended but involvement with motorsport didn’t end there. Satoru worked closely with Honda and helped develop their engines for use in the CART and IRL series over in America. He managed the brief career in F1 of Tora Takagi in 1998/1999 and he owns the Nakajima Racing entry in Japanese Formula Nippon. He helped Tom Coronel and Ralph Firman to titles in this competition. His son Kazuki raced for two seasons with Williams in 2008 and 2009 and today, Satoru still owns his own team in Formula Nippon with both of his two sons competing in the series. Success in Formula One was limited for Satoru Nakajima but his impact put Japan firmly on the Grand Prix map for good. NEXT TIME ON THE DRIVER FILES: Moments of glory at the Nurburgring and Monza in a largely unspectacular career and a Spaniard on the grid before the Alonso days, Marc Gene. The first driver featured in The Driver Files is the Frenchman, Erik Comas. ERIK Comas was part of the former French generation. He came through the junior ranks alongside the likes of Eric Bernard and Jean Alesi. In fact, Alesi only narrowly pipped him to the F3000 championship in 1989. Erik bounced back to win the title the following season, adding to success in winning the French Formula 3 title in 1988. With a proven record in junior formulae, Erik had forged himself a strong reputation and was signed by a Ligier team in 1991 that was going through a period of severe decline. He was never the most exciting or vintage competitor, but had the ability to get the job done. The 1991 Ligier Lamborghini was not a good car, proved by him failing to qualify for his first event in Phoenix. Thierry Boutsen, a Grand Prix winner with Williams was his team-mate and he struggled too with a poor chassis. Comas did well to match his more experienced team-mate, but neither driver scored a point. Erik’s best result in his debut season was 8th placed in a carnaged Canadian Grand Prix. Ligier switched to Renault engines in 1992 and things improved for both drivers. This season turned out to be Comas’s peak in his F1 career. He finished seven of the first nine events and came in the points on three separate occasions. His best ever career result was a fifth place performance at his home event in France. Sixth in Canada and Germany meant he finished equal 11th in the drivers championship, with four points. However, his working relationship with Boutsen took a nosedive as they took each other off in two separate races; (Brazil & Hungary). Both were fired at the end of the season, to be replaced by English duo Martin Brundle and Mark Blundell. Before that though, Erik had a lucky escape during practice for the Belgian Grand Prix. He had a mammoth shunt at the flat-out Blanchimont corner, which knocked him out. Boutsen drove past the wreckage, but Ayrton Senna bravely stopped his McLaren, got out of his car and rushed to his stricken colleague. He held Comas’s head still until the paramedics arrived. Luckily, he only suffered concussion but his race weekend ended there and he never finished a race for Ligier again. Staying loyal to French teams, Erik moved to Larrousse for 1993, partnered by the French no-hoper Phillipe Alliot. He scrambled sixth place at Monza and qualified an excellent 11th in France, ahead of Riccardo Patrese’s Benetton and Gerhard Berger’s Ferrari. However, the accident in Belgium the previous season seemed to have knocked any forward motions in his form. As Larrousse’s finances seriously declined, Comas went backwards and plugged away through 1994, when he was partnered by many team-mates, including Olivier Beretta, Yannick Dalmas and Hideki Noda. If anything, his career will be remembered more for a crazy incident on the fateful Imola weekend. Following Senna’s serious accident, a member of the Larrousse team clearly didn’t realise the situation and allowed Comas out of the pitlane underneath a red flag. He screamed through the flat Tamburello bend and was lucky to be flagged down without clobbering the medical helicopter or track officials. The scenes were so distressing for Erik, he didn’t feel like taking the restart. Although he got blamed for exiting the pits, it seemed like a team communication issue was the main fault. Nevertheless, it was a ridiculous move and just added to the nightmare that was Imola 1994. Comas managed sixth place finishes in Aida and at Hockenheim, but said during the year that he would retire from Formula One if he would end up being outqualified by a Simtek. In Spa, David Brabham managed this and the Australian gloated afterwards, telling media; “I wish Erik a very happy retirement!’ He was replaced by the end of the season, with Jean Denis Delatraz taking his seat for the season finale in Australia. Since Formula One ended for him, Comas spent several years competing in GT racing in Japan, as well as focusing on driver management, promoting further French talent. He suffered from ill health in 2006 and effectively retired from all forms of racing. Today, he runs Comas Historic Racing, which is a service that provides customers to pay and drive historic rally driving cars. Erik Comas ended up having a frustrating Formula One career, which promised much after success in junior formulae, but ended with little joy.